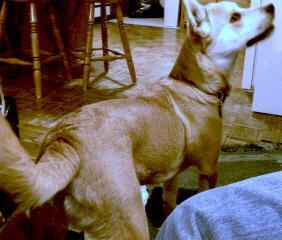 He was a red heeler (Australian Cattle Dog) mix, about 10 years old. Click here to see an older movie of Bugs! But only if you have a very fast connection as it's a large file. It will download and then you have to unzip it. Bugs was chosen as Pet of the Month March 2007 for Pampered Paws Bakery! We got Bugs at the end of January, 2000. When I was growing up, we had a few dogs, but I only remember that one was big and slobbery, and one was a tiny little Pomeranian who was sweet but not very interesting. We had lots of cats that were very affectionate and fun to play with, so consequently, I always wanted cats, not dogs. My husband had never had any pets growing up because his sister was allergic to them. He does not think he likes cats, but I think it's because he never really got to know any. His sister is much more allergic to cats than dogs, so we could not get a cat or else she would never be able to visit. He had wanted a dog for a long time, and we finally had a house of our own, with a back yard, when we were in Lubbock. My friend there, Lynn, also loved dogs, but she did not have a house nor a yard, so she said that we should get a dog and she would get to play with it. Well, Lynn neglected to mention that she was bitten by a small dog when she was a child and so she was also afraid of them! So, anyway, we knew nothing about dogs and did not research them, either. I guess we both just figured that dogs are dogs. We sort of thought we wanted a puppy, but we also didn't want to house train one. We went to the pound to look and see what we could find. Well, they had NO puppies. They had many different kinds of dogs, including a very affectionate Rottweiler that I loved (he kept licking me through the bars), another very sweet dog that kept trying to get under the gate, and a poodle that jumped three feet in the air! There was a sweet scotty dog, too, but she didn't like men, so she would not warm to my husband. 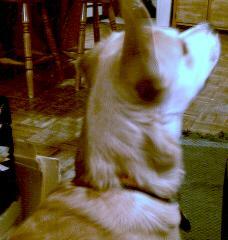 There was also a beautiful husky that we both liked, but it had kennel cough, so we couldn't adopt it. Now, we did not consider our Bugs much at all at first because he did not seem very affectionate or interested in us. However, he was the only dog there that didn't bark, and that was a definite plus right away. They let us put him on a leash and take him out to the bag to look around and see what he was like. He still wasn't very affectionate, but he was not mean or anything, just seemed uninterested. I wanted the rottweiler, but my husband did not want to pay to keep such a large dog. We could not agree on any of the other dogs, so we decided to take Bugs home and see how he worked out. He was originally called "Flops" because one of his ears was broken or something so it flops down, instead of standing straight up like the other one. I collect lady bugs, so we liked the name "Bugs". Apparently Bugs was just very skittish and afraid when at the pound. These dogs get very attached to their owners. His previous owners had put him in the pound because they had a baby and I guess they felt that Bugs would not be good with the child. So poor Bugs felt abandoned by his family, and he was in a new and scary place. No wonder he was acting weird. When we took him home, we kept him on a leash because we were not sure how housebroken he was or whether he would get into things. He was very well-behaved for the most part, but still a bit afraid. The first night there, he barked when I used my computer's printer! Normally he never barks, so that was funny. Apparently it freaked him out. We would come to learn that any strange or loud noise scares him. He settled in with us pretty quickly and made himself at home. We were all set to keep him, but then we learned that he does not always take to strangers. He barked, snapped or growled at some people but was fine with others. Apparently this is an ACD trait. Most dogs do not like it when someone they don't know reaches down to pet them on their head. They like it when you first hold your hand out, palms out, and let them lick and sniff you, or even better yet if you just stand there or sit there and ignore them while they sniff you. But a lot of dogs are so timid that they will sit there and take it anyway, although you will see them cringe. Ours will not take it from some people. We didn't know that. At first we thought Bugs was just a psycho dog that we couldn't keep because we couldn't trust him not to try to bite somebody. We were relieved to find out otherwise. However, we called a woman in the phone book that was a dog trainer. She taught us about dogs and showed us how to train this one. Bugs already knew commands like "sit" and "no"--we just didn't know how to command him. It's kind of like sitting down to a computer for the first time and not knowing how to use it. Someone has to train you how to access certain things. So we quickly found out how to get people used to him, how to teach him to mind us, etc. and it worked out great. He used to chew up my shoes and get in the trash until I found out that you can buy a bitter apple spray that dogs hate. After spraying him a few times in the mouth after he chewed something he shouldn't, he never did it again. In fact, he would run and hide any time I had any spray can in my hand! It turns out that this dog really likes to please us and doesn't like any yelling or loud noises. He runs and hides if we even raise our voices (or even if people on TV do), or if there is thunder. Sometimes he will run away from the ice machine in the fridge. However, if we put him on a leash, or if he is in our house, he will bark furiously at strangers or anyone near our house or our car. He is our great protector. It makes it hard sometimes that we have to keep him away from most strangers, but that's just the kind of dog he is. He is our baby. We don't have kids, but we have our Bugs. He is an endless source of great joy and amusement (and often irritation). We never get tired of his antics. He jumps around in excitement if we take him out in the car, especially if it is to the park (his favorite place). It's so much fun to watch him. And he sneezes when he is excited like that. He loves to play and run around. ACD's are very high-energy dogs so you have to exercise them a lot. We used to take him on a 2-mile walk at least once a day. Now that he's older and has arthritis, we just take him on a short walk. He still has a lot of energy and likes to play. We try not to spoil him, but it's hard. He has his own bed in his own room. It was not planned that way...we don't let him sleep on our bed, but we didn't care if he slept on the other beds (we had two guest bedrooms), so he just started sleeping on one of them, so that became his room. He has a whole basket of toys, most of which are remnants of toys he has chewed up. He likes to chew them up, especially if they are the cloth kind with a squeaker in it. I used to get nice toys from the pet store, but now I just get him a toy from the dollar store...it's just a waste of money otherwise. Originally, he was supposed to be a "yard dog", but that didn't last long. He likes to be inside with us. The reason they are called "heelers" is that they stick to your heels. They are bred for herding cattle. He likes feet and following us around. I can't tell you how many times we have accidentally kicked him in the head. But these dogs have very hard heads. He has hit it hard on the corner of a table and it didn't even faze him. We travel quite often, so we board Bugs in the kennel at the Vet's office. He loves the people who work there at Dr. May's office, and they love him, too. He also got along very well with the people at the vet's office in Lubbock. He is always excited to go to the vet's, and always excited to come home as well. My mother-in-law has always loved our dog, and vice versa. When she used to visit, she would pet him so much, and after she left, he would mope around for a week. She moved in with us for a few years, so both were very happy. He got a lot of extra spoiling from her. She is his grandma. He misses her now that she has moved out (to a retirement home in another state). We have been very lucky that Bugs has no real problems. He is middle-aged now but has no health problems other than allergies...he itches and scratches a lot in the summertime, and we have to take him to get a shot and some eyedrops. Bugs will eat almost anything, but he doesn't like vegetables much, or certain fruits. He will only eat veggies if they have been cooked and have a lot of herbs or sauce on them. He won't eat rice or any kind of lettuce. You should never give a dog chocolate, onions, grapes, raisins, or avocados. Some of these things can kill dogs and some can make them very sick. Bugs eats pretty much anything else....he's not a picky eater. Bugs is getting up there now. He's somewhere around 14 or 15. He mostly sleeps. I have learned so much since getting Bugs, and above all, I have learned that I love dogs, maybe even more than cats. I have become a real "dog idiot", one of those people I used to make fun of. Every time we drive or walk past a dog now, I have to point it out and say, "ooh!! A dog!!" We have two dog calendars. And now this page. I hope you enjoy all the pictures!! UPDATE: Bugs was very old and arthritis. He was just in pain all the time and doped up by medication. He didn't want to play or walk any more. We had to put him to sleep at the vet's office, which was very sad for all of us. He was a great old dog and gave us so much pleasure. We moved to Hawaii for three years; we rented apartments that didn't allow pets. Now that we've moved again and have our own house, we look forward to adopting another rescue dog! This picture below is not Bugs but another very cute ACD!